The West End might be known for its large scale productions, flashy visuals and sweeping emotional scores, but Forbidden Broadway brings cabaret style musical-comedy entertainment from the Menier Chocolate Factory to the main stage, rinsing its big brother shows for all their worth. Can’t decide what show to see of an evening? The four-strong cast perform them all in a fraction of the time. Miss Saigon is reduced to a handful of songs and oriental clichés; the key songs of Les Miserables are delivered from an invisible rotating stage; and the only song you need to hear from Wicked is hilariously upturned by a sassy Elphaba – ‘Defying Subtlety’. The detail of each parody is remarkable and whilst there are some jokes that only diehard fans will understand, you don’t have to be a musical theatre aficionado to enjoy the show. That said, it’s the modern classics that provide the funniest moments. Ever wondered what the cast of Cats would sound like singing A Chorus Line? Now you can. Bratty “exploited” children from Matilda and Billy Elliot make an amusing appearance. The Lion King is simply a Disney cash-in. And Once is lampooned with side-splitting effect: from the ridiculous hoovering, to the Irish musicians (“potato!”) and dodgy accents with “impish Czechoslovakian charm”. It’s clear, too, that the setlist often changes – a song from Evita has now been added, though it fell a little flat as it’s perhaps too current for the audience to get the joke. What makes the show so satisfying is its accuracy. The lyrics don’t shy away from biting criticism, often describing what we’re all thinking: Les Mis really is too long; Charlie and the Chocolate Factory is a poor Matilda imitation; and The Book of Mormon is full of “childish music and lyrics that appal”. Yet it’s all delivered with a knowing wink and a deep level of reverence for the source material. It’s not just the shows themselves that are parodied, but the people behind them – the performers, the producers and even the critics. Sondheim is forever criticised for his lack of melody, but this rendition of ‘Into the Words’ features a sing-along that proves him right. Elsewhere, there are hilarious imitations of Kristin Chenoweth’s squeaky operatic tones, Hugh Jackman singing ‘Hugh Am I’ (complete with Wolverine hair), Liza ‘one-note’ Minelli, Adele Dazeem singing ‘Let It Go’ from Frozen (“my nodes never bothered me anyway”) and even a midget Elaine Paige, amongst others. It’s with these impressions that the cast truly reveal their talents. Christina Bianco may not have been in attendance, but her understudy Laura Tebbutt was a more than capable alternative. There’s no point taking the piss if you don’t have the ability to back it up, but Tebbutt, Anna-Jane Casey, Damian Humbley and Ben Lewis are all brilliant performers with impressive vocals. Forbidden Broadway could take a leaf out of its competition by offering something extra beyond the cabaret setting. Accompanied solely by piano, a small band would certainly boost the sound and a bigger finale number would round-off the show more effectively. That said, if you’re anything like me, you’ll be howling from start to finish. 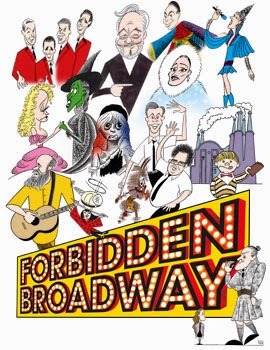 Watch: Forbidden Broadway runs at the Vaudeville Theatre until 22nd November.